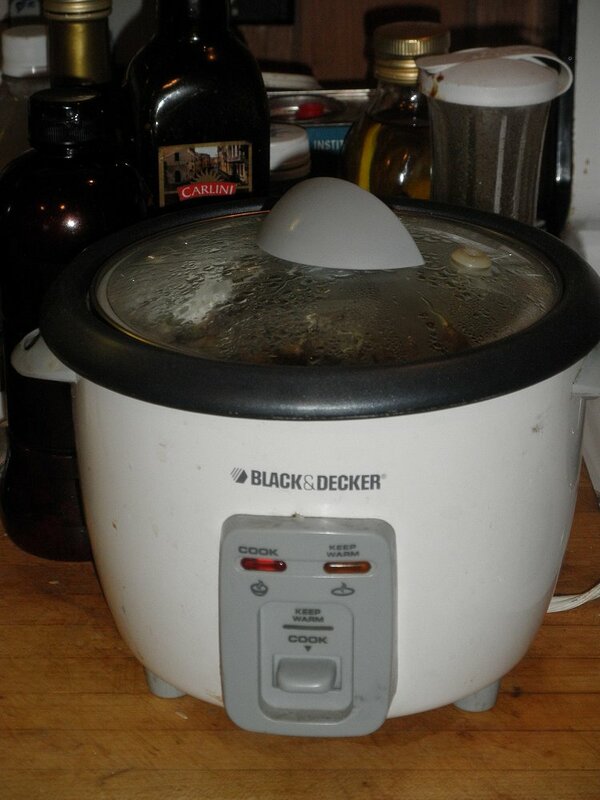 This rice/veggie steamer might be the single electrical appliance I’ve used more than any other my entire lifetime. Originally cost me $1.00 still in the never-been-open-box at the Salvation Army Thrift Store, Kerrville, Texas. Several years of heavy use for that buck. I like to get a few calories with my meals, so I used half-jar of strawberry preserves from Dollar Tree [$1.00] as chutney. Spices added were celery seed, black pepper, lime powder, onion powder, in addition to the various chopped poblanos Anaheim green bell peppers and fresh cilantroso on in the taste explosion. 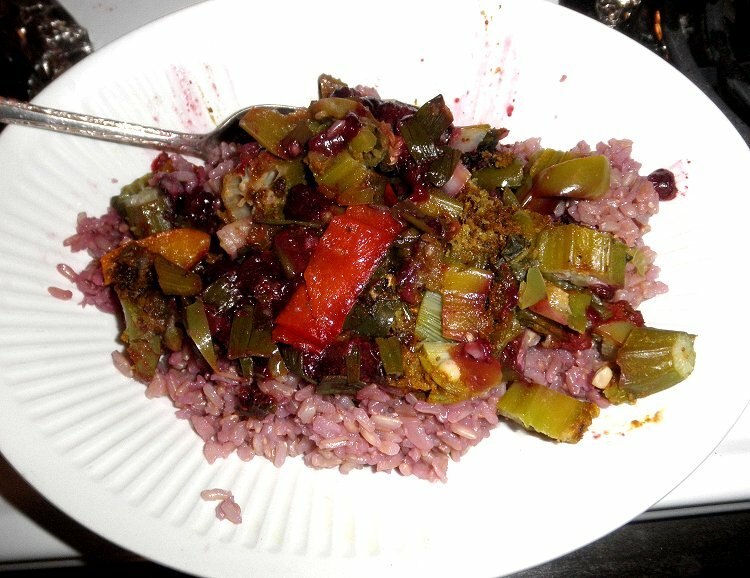 Curry steamed ginger blueberry okra pepper asparagus on rice: If it’s looks you’re after you could toss a sprig of parsley across it, I suppose, or add a slice of orange, maybe. It went down smooth and easy, didn’t attempt to come back up. All’s well that ends well. And the ticker won’t be sneaking around finding excuses to blink or belch from the sodium. Prepared with no sodium added, this is a no sodium meal. On the other hand, if you want it to be a 2 gram sodium meal add two grams of salt. This entry was posted in 2013, America and tagged cuisine, culture, curry, food, ginger, Human Behavior, humor, Life, lifestyle, low salt, low sodium, no salt, senior citizens, society, sociology. Bookmark the permalink. This looks like a tasty dish, except for the okra. However, I like to try new dishes now and then, so I’ll go ahead and experiment with this. Thanks for the idea. I’m still trying to digest the concept. Okra is a favorite. Kinda got lost in all those ingredients. Glad it went down smooth. Blessings, M.